Have grilling questions? We've got answers! Come check out Fran's Feathered Friends! Large enough to supply your needs. Small enough to provide great service! 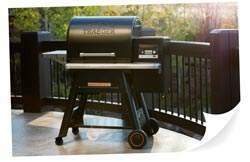 Timberline 850 and Timberline 1300 models AVAILABLE NOW – start grilling tonight! Traeger Grills, Garden Supplies, Dog Food, Cat Food & More! Burns Feed Store in Gresham, OR serves everyone from large farms to hobby farmers and gardeners. Whether you have dogs, cats, horses, chickens, or just about any other domestic animal, we can help them stay well fed, healthy and happy. We have a wide range of supplies including Traeger Grills, dog food, cat food, lawn and garden supplies, horse tack, hardware, and much more. We have experts in every department that can help you decide what chicks are best for laying eggs, what type of saddle to put on your horse, or give you Christmas gift ideas for Aunt Sally. Burns Feed Store is large enough to supply your needs, but small enough to provide great service. We serve the communities of Portland, Sandy, Damascus and Gresham. Join our mailing list to receive the latest news and updates from Burns Feed Store. We have new breeds of geese coming in 2019! For Burns Feed Store, customer service is our top priority. We have an experienced, knowledgeable staff that can help you with questions related to farming, gardening, ranching, horses, pets, or whatever else you might ask about. We try to support local businesses in the communities of Gresham, Sandy, Boring, and Damascus. If you’re happy with the service we provide, it would definitely help us out to get a good Google or Yelp review!